Featuring vacuum insulation, the Thermos Alfi Gusto 1L Vacuum Insulated Carafe provides maximum temperature retention. 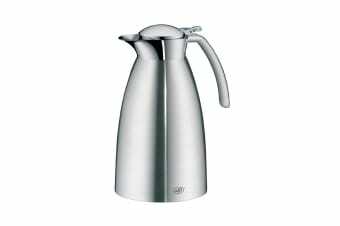 The Thermos Alfi Gusto 1L Vacuum Insulated Carafe is a stylish stainless steel accessory with mat finish to serve hot or cold beverages easily. It has a comfortable pouring system for easy and drip-free pouring and is dishwasher safe for easy and hygienic cleaning.